You are currently browsing the tag archive for the ‘Alyxandra Harvey’ tag. 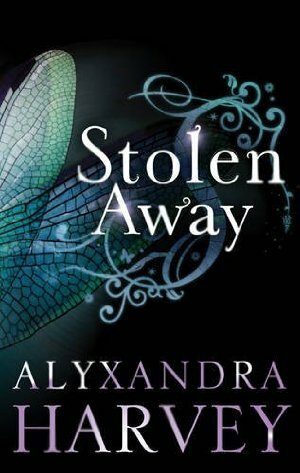 Stolen Away is a standalone novel by the author of the Drake Chronicles (to date, My Love Lies Bleeding, Blood Feud, Out for Blood and Bleeding Hearts) and Haunting Violet. Stolen Away has much the same strengths and weaknesses as Harvey’s other novels. It seems that she’s not changing much as an author; she’s found her rhythm and is sticking to it with little improvement (or degeneration). But the result is a set of entertaining, pleasant enough novels; and if she’s happy and her audience is happy, does she really need to push herself? Eloise Hart is a pretty ordinary teenage girl. She doesn’t fit with the cool kids, but she does have her good friends – notably, Jo and Devin. She has her share of insecurities, but she’s also pretty comfortable with who she is. Her family is a bit unusual – her single mother dresses like a rockabilly and tends bar, and her aunt appears every year for around six months and then disappears completely for another six. She’s not even contactable during those six months. Bleeding Hearts is the fourth book in the Drake chronicles, following on from My Love Lies Bleeding, Blood Feud, and Out for Blood. 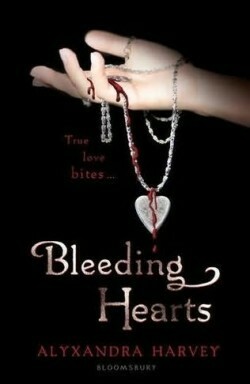 Like its predecessors, Bleeding Heart is an enjoyable and well written young adult novel. The Drake Chronicles follow a clear pattern. In each novel one of the seven Drake brothers falls in love. The Drake family are vampires; they are unusual in that they are not “turned” by another vampire – instead, when they turn sixteen they also turn into vampires. This significantly reduces the yuk factor when it comes to their becoming vampires; it also provides a credible explanation for the existence of an entire family of vampires. (There are some flaws if you think too hard, such as the question of why their father doesn’t look sixteen; but generally this is a well constructed world.) Importantly, it also means that we are reading stories of vampires who are either the same age as or only a few years older than the teenage girls they fall in love with. For me, this is less creepy than all those vampires who are one or two hundred years old and still fall for sixteen year olds. 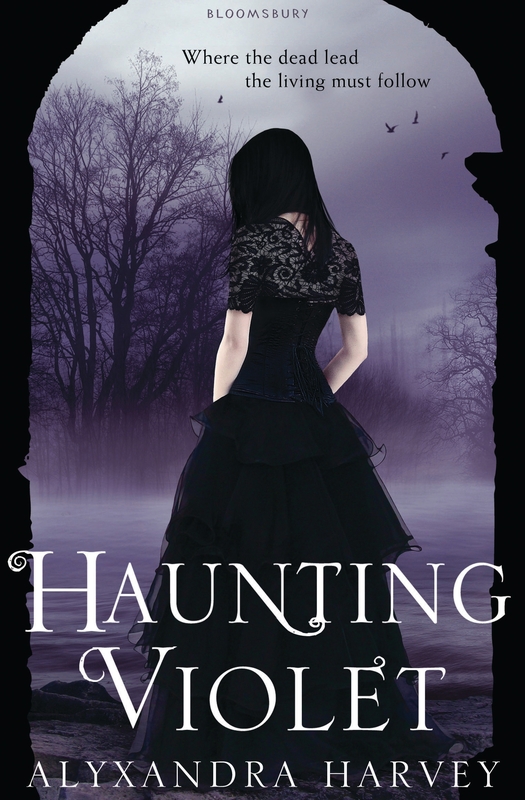 Haunting Violet is a standalone novel by the author of the Drake Chronicles (to date, My Love Lies Bleeding, Blood Feud, and Out for Blood). At least, I assume this is a standalone novel; it reads that way, although there is the potential for some major characters to reappear if this turns out to be a series. When Violet Willoughby was nine years old, her mother told her that she was old enough and pretty enough to help with the family business. To put it bluntly, they con the grieving; Violet’s mother pretends to be a medium who can put the rich and gullible in touch with their lost ones. Violet is sickened by the pretense and by taking advantage of people so obviously grief-stricken. Her mother has no qualms, feeling that the world owes her a living and this is the easiest way for her to get it. And in fact, she’s quite good at her faking. They live a life short of luxury, but certainly of greater security than they could otherwise achieve. Why, it even looks like Violet, now 16, could make a good marriage to a rich man. Out For Blood is the third in the Drake Chronicles. 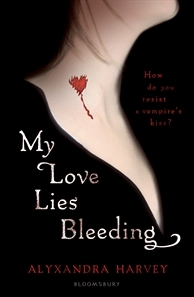 Volumes one (My Love Lies Bleeding) and two (Blood Feud) have both been reviewed here. Although there is an overarching story to the series, each volume focuses on a different Drake sibling’s romance. In this instance, the focus is Quinn Drake. He’s the fourth Drake son, twin to Connor. And like all six of his brothers, and his sister, he became a vampire when he turned 16. In the earlier novels, his mother Helena kind of accidentally became the vampire queen while protecting her only daughter, Solange, from assassins. 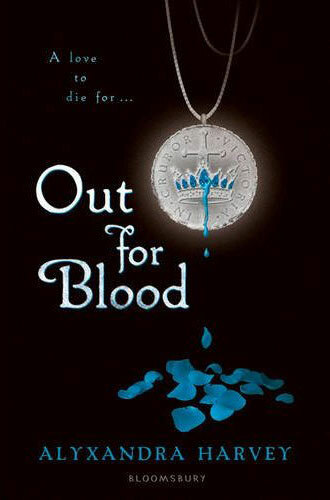 At least some of the assassins promptly turned their attention to Helena, and one of the early events in Out for Blood is the resulting low key and semi-secret coronation ceremony. It’s at this ceremony that Quinn first lays eyes on Hunter Wild. Hunter is the latest in a long line of vampire hunters and doing very well at the Helios-Ra Academy – essentially, a high school for vampire slayers. She’s open to the recent truces that have been developed between some vampires and the Helios-Ra, but the grandfather who raised her believes that the only good vampire is a staked vampire. Which is going to prove inconvenient when Quinn seems irresistible to Hunter. 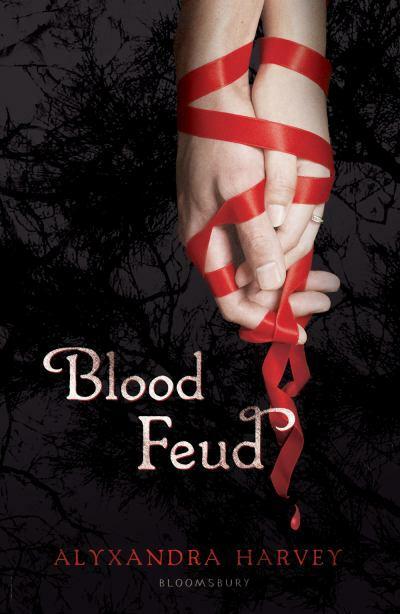 Blood Feud is the second volume of the Drake Chronicles. Since the Drakes are a large family – seven boys and one girl in the immediate family alone – and each of the two volumes so far have focused on a different Drake, it’s entirely possible that this could be an extended series. That’s not a bad thing; these are good novels likely to be enjoyed by their young adult target audience. This second novel, however, may be a little less attractive to an older audience than the first one, My Love Lies Bleeding, was. As the novel opens, Logan Drake’s mother Helena has become a vampire Queen. She didn’t particularly want the job, but it sort of happened in the course of saving her daughter Solange (the full story is detailed in My Love Lies Bleeding). Not everyone wanted her to get the job either, and an assassination attempt occurs early in the preparations for her coronation. Many dignitaries are coming to the coronation. One is Isabeau St Croix, there to represent the Hounds, a reclusive vampire tribe. Isabeau survived the French revolution only to be turned into a vampire, and left in her grave for 200 years until rescued by the Hounds. Now she is one of their Princesses, and sent to Court to negotiate an alliance with the new Queen. Within moments of arrival Isabeau finds herself negotiating a very informal alliance with Logan Drake. The two of them are instantly and strongly drawn to each other. And it seems that at least one of those with an eye to executing the new Queen is the vampire who turned Isabeau, someone she’d dearly like to meet in a dark alley. So Logan and Isabeau team up to gain revenge and protect their loved ones. As with the first novel in the series, this is well written. Harvey has thought through the background to her vampires, and added an original twist (that some vampires can be born, due to specific genetic traits, but the children don’t become vampires proper until they reach puberty). Her prose is simple and enjoyable, and she has a good eye for writing action scenes. She also touches on events in the earlier novel without going over them in any detail; new readers won’t be confused and returning readers won’t be bored. I’m beginning to wish that publishers would stop labelling books “for fans of Twilight” or “for fans of Stephenie Meyer”. I know why they do it, but in a number of cases recently that’s actually sold the novel in question short, as it’s much better than any in the Twilight series. That’s true of My Love Lies Bleeding. Although it features vampires and teenagers, it doesn’t have a lot else in common with Twilight, and it’s a very good novel. I was pleased to find it’s the first in a series. Solange and Lucy are fifteen, nearly sixteen, and they’ve been best friends for their whole lives despite their differences. Solange comes from a large family, with seven older brothers, while Lucy is an only child. Solange is quiet and reserved, while Lucy is outspoken and bordering on obnoxious. And around the time Solange turns sixteen, she must become a vampire or die. Lucy is an ordinary human. Harvey has created an interesting addition to the vampire mythology here. While most of her vampires are created in the “usual” fashion – by being turned by another vampire – there are a few very old families which carry a genetic condition which makes their children vampire born. Apparently normal humans until their mid-teens, at that time the condition kicks in and the children must either become vampires (by drinking blood) or die. Solange and her brothers belong to such a family. Her father was vampire born; her mother human, although she became a vampire after Solange’s birth. Apart from the small number of “vampires born”, Harvey sticks pretty close to the traditional mythology around vampires.